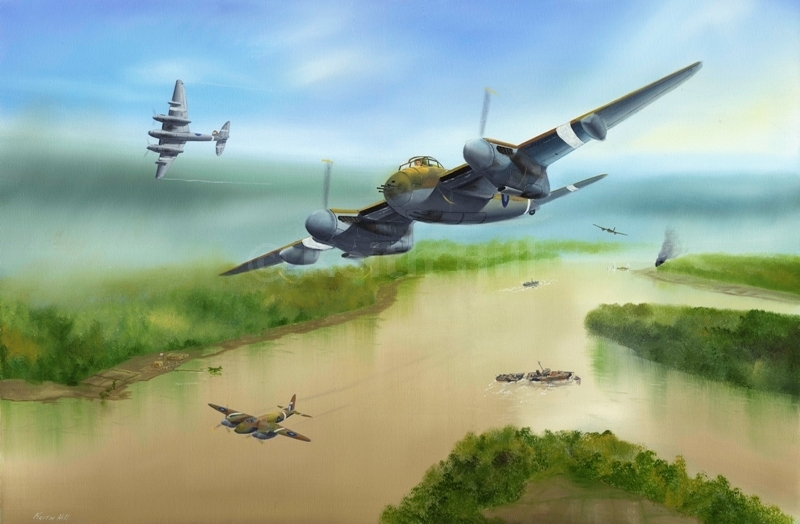 An RAF Mosquito over Burma. Selecting 'Yes' above will add an original pencil sketch by Keith, in the print border, either side of the print title. There is an additional cost for these sketches of £79. Please allow up 2-4 weeks delivery time, Keith will contact you with a more accurate delivery estimate. Contact Keith with your preferred subject matter or to discuss ideas. Shipping: UK P+P £6 Overseas P+P £12 For more details, click here. 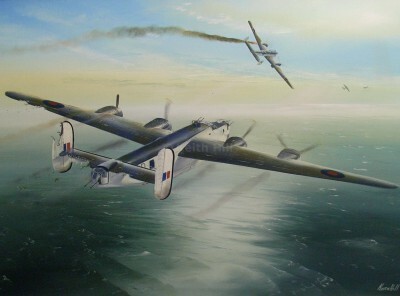 Original Oil Painting Oil on Canvas, £1995, contact Keith for details. 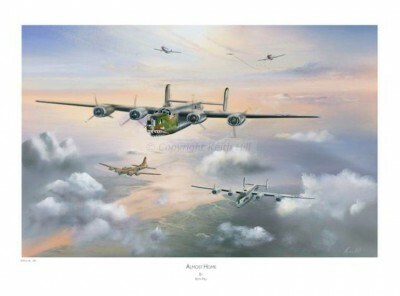 B-24 'Liberators' of the 36th Bomb Squadron from Cheddington, (later Alconbury), return after another Electronic Counter Measures mission over occupied Europe in 1944. B-24 Liberator of 206th Squadron, RAF Coastal Command off the coast of Norway when the crew successfully fought off an attack by 3 Luftwaffe Bf110's. 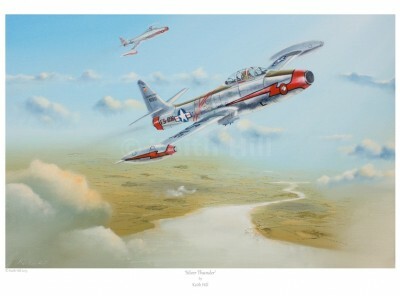 The print is signed by a D-Dog veteran, Don Knight. 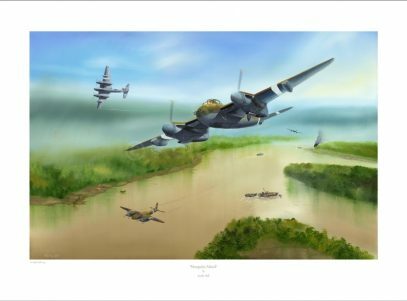 Print #2 in The Silver Wings Collection. 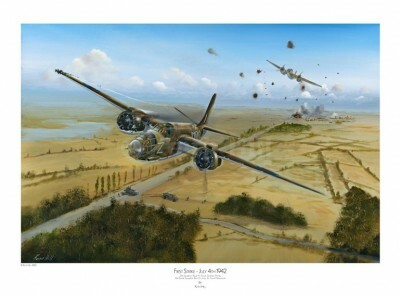 The very first mission flown by the 15th Bomber Squadron, July 4th 1942. 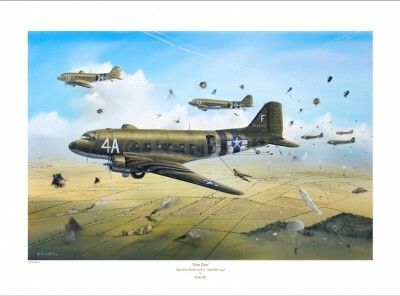 C47's of the 315th Troop Carrier Group from Spanhoe Lodge Airfield in Northamptonshire, drop paratroopers into Holland during Operation Market Garden – September 1944. The print is countersigned. 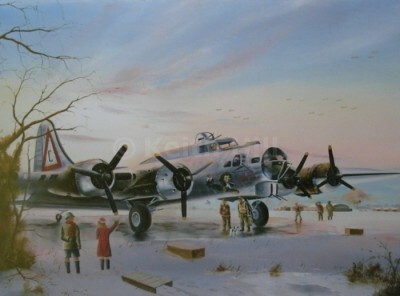 B-17 of the 303rd Bomb Group, used as the cover to children's book 'Homers Luck', about the spotty dog that was a mascot who had many adventures with his crew. 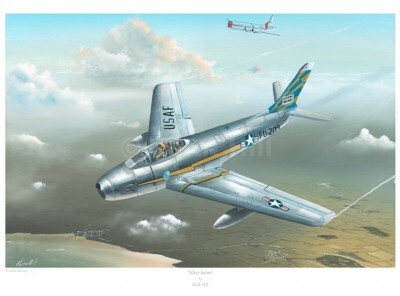 F84 Thunder Jet of the 20th Tactical Fighter Wing. Print #3 in The Silver Wings Collection. 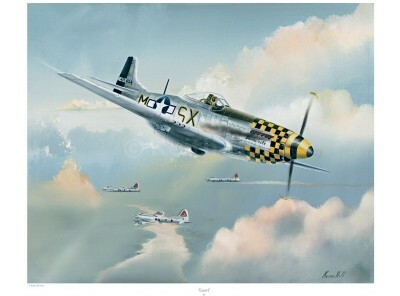 P-51 Mustang of the 353rd Fighter Group.